@Sweet. I am aware of that problem, teammate topdog reported it but I havent fixed it yet. It's because WMI Service is deactivated or misssing, but the wrapper will work without it fine if you select 'Continue'. [ERROR] No valid benchmark configurations found. When you try to lunch it, the bench crash and return to desktop with o points -.-"
I try XP SP2 NET 4.0 and SP3 NET 4.0 but the problem persist! i can do a video of this problem! i tried a lots of driver version! 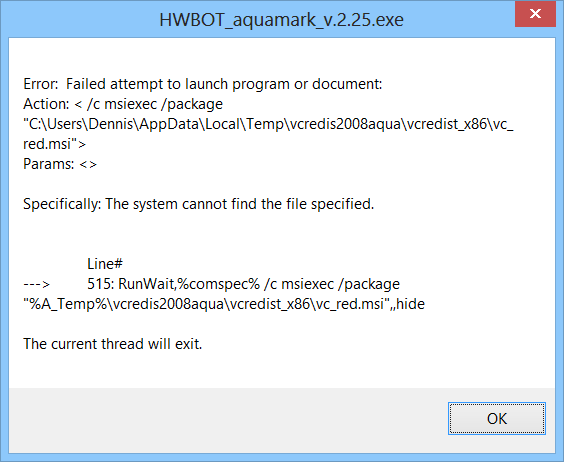 See if it works without wrapper, launching aquamark3.exe directly. I assume not. i try different driver 44.03/52.16/30.82/61.77/66.93 and so on! no problem with 4 TI 4200! Make sure those cards can actually run the benchmark by starting without wrapper (go to C\ProgramFiles\Hwbot\Aquamark\Files and run aquamark3.exe directly). With wrapper --> no work. Ok, I will look over it tomorrow and see what might cause this. No can do sir, Im using GPUZ for gpu info so it has to be run from the wrapper. This way im also preventing invalid screenshots where he forgot mem tab or whatever. Will however include it in the F7 hotkey (currently opens cpuz/gpuz first, but it seems wiser to make it an alternative). Not yet. Do you have a skype/fb/gtalk account so I can communicate faster with you? Like the new wrapper 2.25, no problem running worked prefect with a firegl v5100 but did have problem when submitting, had to manually enter all data for cpu, mb & video card. Hardware not recognized from submittal file. That is something normal ATM, the more stuff being submitted the more we can link to the hardware in HWBOT's database. It's weird because I checked the path and the file is really there . I'm running Windows 8. Guessing it didnt find msiexec, which is the Microsoft Installer Service. I did try it on Win8 and had no problems, will try it again, this time with UAC ON and/or MSI service OFF. (on Win7/8 I could probably just skip installing the redis as it already works with the ones coming bundled with Windows). I need to know what settings Aquamark uses when run without wrapper on these IGP cards.